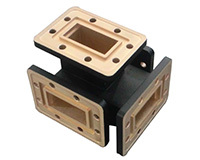 Vector Telecom's Magic Hybrid Tee is four-port coupler for matching, balance and isolation. E-plane to H-plane Isolation is a function of the symmetry which is carefully balanced on each unit. If the E-plane port 4 or the H-plane port 2 are used as inputs the split is on the output collinear ports 1 and 3. When the input is E plane port 4 the outputs are out of phase 180 deg. When the input is H plane port 2 the outputs are in phase. The in-phase and equal amplitude signals inputting into two collinear ports can result combined signals at H-plane port and cancelled signal at E-plane port. This feature is widely used in monopulse antenna feed structure and phasing testing setup. *** Typical operating bandwidth of the hybrid tee is up to 15% of waveguide center frequency. Performance degradation may occur while it covers wider waveguide bandwidth.